Implants have a predictable outcome and are the foremost treatment modality for prosthetic rehabilitation of edentulous patients. Due to loss of bone after extraction and pneumatization of maxillary sinus, there is insufficient bone volume for implant placement. The direct maxillary sinus lift procedure has been performed with different grafting materials (autogenous bone grafts, alloplasts, allografts, and xenografts) and without grafting material, having new bone formation around the implant. There is no evidence to prove the need for grafting material in all direct sinus lift procedures, hence the need for this review. Previous meta-analysis showed that survival rates of implants placed in grafted maxillary sinuses had similar survival rates whether autogenous, allogenous, or alloplastic grafts were used. This paper aims to review scientific data on the direct sinus elevation technique without use of any grafting material, volume of new bone formed, and also mechanism behind this technique. Articles were searched from 1997 to October 2014 in PubMed, Google Scholar, and Cochrane CENTRAL. The study eligibility criteria were (1) direct sinus lift procedure without any graft material during implant placement and (2) human or animal studies with a minimum follow-up of 6 months or more. Two authors independently scrutinized the literature and if any controversy was raised, third author's opinion was sought to arrive at a mutual consensus for including the study in the review. Due to the heterogeneity across all studies in all study designs, the data were not pooled and a meta-analysis was not performed. Taking into consideration all factors reviewed in this regard along with the outcomes, the direct sinus lift technique without grafting can be suggested as a viable treatment option keeping in mind the limitations involved. The average bone gain was seen across all studies ranging from 2.37 to 10 mm and with an implant survival rate ranging from 79.9% to 100% across studies. Purpose: To hypothesize a new theory based on soft tissue reference points on lateral profile photographs (LPPs) for determining the vertical dimension of occlusion (VDO), as there is need to explore for simple strategies. 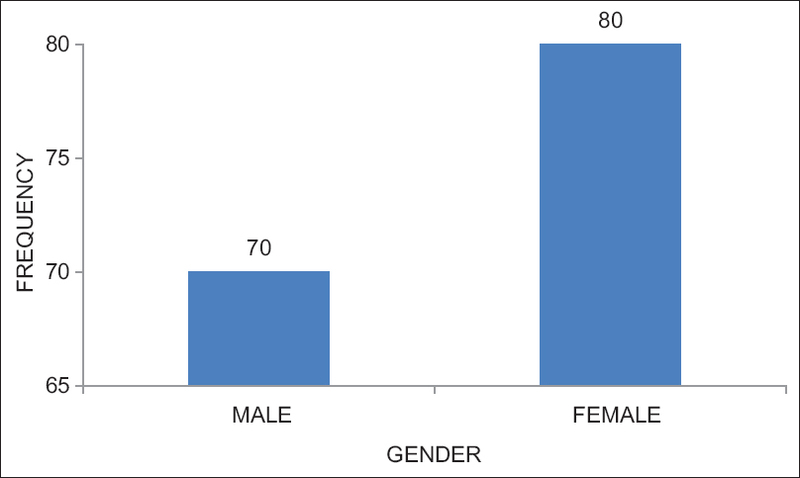 Materials and Methods: Fifty-three participants in the age range of 20–27 years who met the inclusion criteria were recruited. 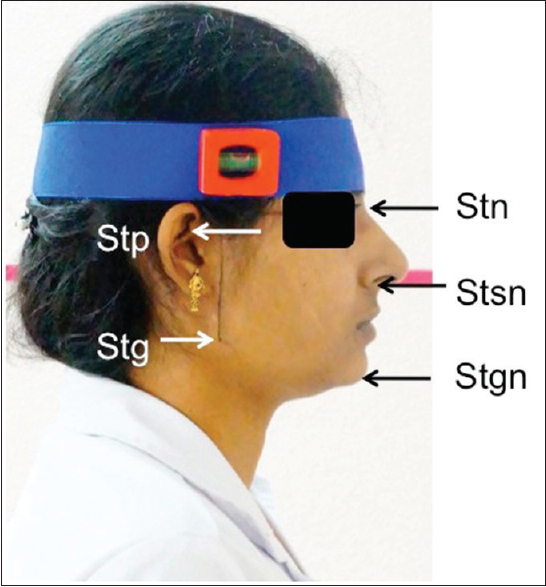 LPPs were taken for all participants using standard protocol and duplicate copies obtained, on which five soft tissue reference points, nasion (Stn), subnasale (Stsn), porion (Stp), gnathion (Stgn), and gonion (Stg) (Stg prenoted on the face) were marked and joined to form angles; distance between Stsn and Stgn was considered as VDO in LPP (VDO-LP). The angle formed between Stn-Stsn-Stgn and Stn-Stsn-Stg; Stp-Stg-Stgn and Stp-Stg-Stsn was correlated; two simple linear regression models were developed to predict Stn-Stsn-Stgn and Stp-Stg-Stgn using Stn-Stsn-Stg and Stp-Stg-Stsn as independent variables. Using the formulae, VDO-LP predicted was constructed and correlated with the actual values. Results: The angle Stn-Stsn-Stgn had a statistically significant moderate positive correlation with Stn-Stsn-Stg (r = 0.57, P< 0.001) and angle Stp-Stg-Stgn, a significant strong positive correlation with Stp-Stg-Stsn (r = 0.81, P< 0.001). Using simple linear regression analysis, the following formulae were obtained: Stn-Stsn-Stgn (in degrees) = 0.776 Stn-Stsn-Stg (in degrees) +79.01 and Stp-Stg-Stgn (in degrees) =1.331 Stp-Stg-Stsn (in degrees) +10.2. The predicted and actual VDO-LP values were in strong positive correlation with a coefficient of 0.8. Conclusion: With the use of simple landmarks on LPP, it is possible to reconstruct the lost facial dimensions during prosthetic replacement of lost teeth. Purpose: The purpose of this study was to evaluate and compare the flexural strength and microhardness of provisional restorative materials fabricated utilizing rapid prototyping (RP), Computer Assisted Designing and Computer Assisted Milling (CAD-CAM) and conventional method. Materials and Methods: Twenty specimens of dimensions 25 mm × 2 mm × 2 mm (ADA-ANSI specification #27) were fabricated each using: (1) Three dimensional (3D) printed light-cured micro-hybrid filled composite by RP resin group, (2) a milled polymethyl methacrylate (CH) using CAD-CAM (CC resin group), and (3) a conventionally fabricated heat activated polymerized CH resin group. Flexural strength and microhardness were measured and values obtained were evaluated. Results: The measured mean flexural strength values (MegaPascals) were 79.54 (RP resin group), 104.20 (CC resin group), and 95.58 (CH resin group). The measured mean microhardness values (Knoop hardness number) were 32.77 (RP resin group), 25.33 (CC resin group), and 27.36 (CH resin group). The analysis of variance (ANOVA) test shows that there is statistically significant difference in the flexural strength values of the three groups (P < 0.05). According to the pairwise comparison of Tukey's honest significant difference (HSD) test, flexural strength values of CC resin group and CH resin group were higher and statistically significant than those of the RP resin group (P < 0.05). However, there was no significant difference between flexural strength values of CC resin and CH resin group (P = 0.64). The difference in microhardness values of the three groups was statistically significant according to ANOVA as well as the intergroup comparison done using the Tukey's HSD (post oc) test (P < 0.05). Conclusions: CC-based CH had the highest flexural strength whereas RP-based 3D printed and light cured micro-hybrid filled composite had the highest microhardness. Statement of Problem: When reconstructing the occlusal curvatures dentists often use a 4-inch radii arc as a rough standard based on Monson spherical theory. The use of an identical radius for the curve of Spee for all patients may not be appropriate because each patient is individually different. The validity of application of this theory in the Indian population and the present study has been undertaken. Aims and Objectives: This study is an attempt to evaluate the curve of Spee and curve of Wilson in young Indian population using three dimensional analysis. This study compared the radius and the depth of right and left, maxillary and mandibular curves of Spee and the radius of maxillary and mandibular curves of Wilson in males and females. Materials and Methods: The cusp tips of canines, buccal cusp tips of premolars and molars and palatal/lingual cusp tips of second molars of 60 maxillary and 60 mandibular casts were obtained. Three-dimensional (x, y, z) coordinates of the cusp tips of the molars, premolars, and canines of the right and left sides of the maxilla and mandible were obtained with three dimensional coordinate measuring machine. The radius and the depth of right and left, maxillary and mandibular curves of Spee and the radius of maxillary and mandibular curves of Wilson were measured by means of computer software Metrologic-XG. Pearson's correlation test and Independent t-test were used to test the statistical significance (α=.05). Conclusion: The values of curve of Spee and curve of Wilson in Indian population obtained from this study were higher than the 4 inch (100 mm) radius proposed by Monson. These findings suggest ethnic differences in the radius of curve of Spee and curve of Wilson. Purpose: The aim of this in vivo study was to compare the single-step border molding technique using injectable heavy viscosity addition silicone with sectional border molding technique using low fusing impression compound by evaluating the retention of heat cure trial denture bases. Materials and Methods: Ten completely edentulous patients in need of prostheses were included in this study. Two border molding techniques, single-step (Group 1) and sectional (Group 2), were compared for retention. Both border molding techniques were performed in each patient. In both techniques, definitive wash impression was made with light viscosity addition silicone. The final results were analyzed using paired t-test to determine whether significant differences existed between the groups. Results: The t-value (3.031) infers that there was a significant difference between Group 1 and Group 2 (P = 0.014). The retention obtained in Group 2 (mean = 9.05 kgf) was significantly higher than that of Group 1 (mean = 8.26 kgf). Conclusion: Sectional border molding technique proved to be more retentive as compared to single-step border molding although clinically the retention appeared comparable. Background: Loss of teeth affects the individual's health. Many factors determine the need to wear a removable dental prosthesis. Due to nature of design, age and lack of awareness, prosthesis often are neglected to maintain in an aseptic condition leading to microbial contamination. This provided an impetus for the present study with the aim of determining the microbial contamination of removable dental prosthesis. Methodology: Total, 45 patients wearing removable dental prosthesis were randomly selected. Patients were divided into three groups as per duration of usage since 1 month, 6 month and ≥1 year. Sterile cotton swab moistened with phosphate buffer saline (PBS) was used to collect swab from the fitting areas of prosthesis. Swab samples was inserted immediately into the sterile tube containing 1 ml of PBS solution, 10μl PBS is inoculated on the blood agar and MacConkey agar plates using spread plate technique. Samples were cultured and incubated at 37°C for 48 h. Calibrated microbiologist isolated, identified and counted microorganisms using colony counter. Depending on the nature of data, statistical analysis was done applying Kruskal–Wallis test, Mann–Whitney U-test and Chi-square test. 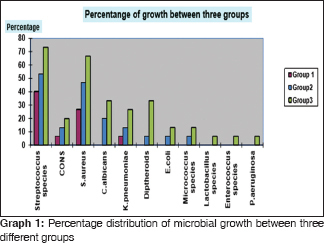 Result: Streptococcus species and Staphylococcus aureus were the common microorganisms isolated in all three groups and was statistically significant at P<0.05. Candida albicans, Diptheroid, Escherichia coli, Micrococcus species were isolated from Group II and Group III. Conclusion: There is a linear increase in microbial contamination of removable dental prosthesis as the duration of usage increases and might increase the susceptibility of individuals' to many diseases. Background and Objectives: This in vitro study compared the shade matching abilities of an intraoral spectrophotometer and the conventional visual method using two shade guides. The results of previous investigations between color perceived by human observers and color assessed by instruments have been inconclusive. The objectives were to determine accuracies and interrater agreement of both methods and effectiveness of two shade guides with either method. 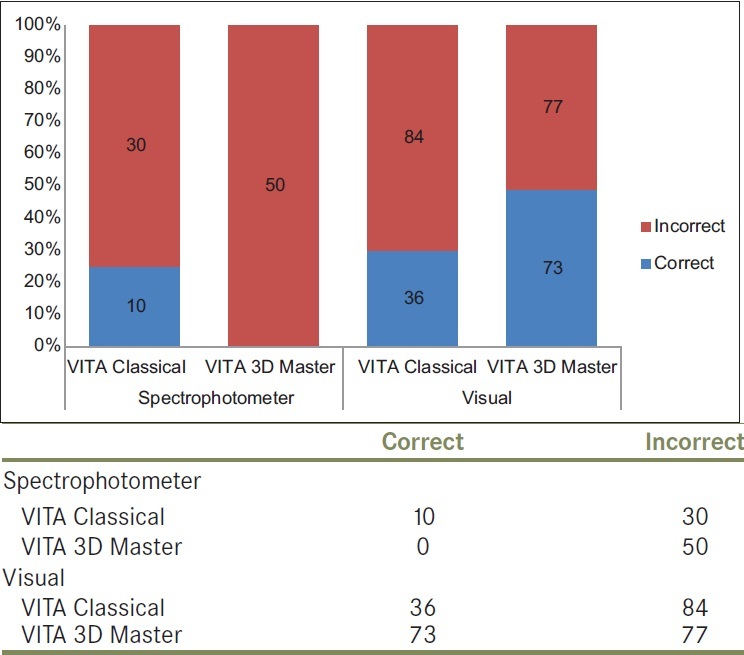 Methods: In the visual method, 10 examiners with normal color vision matched target control shade tabs taken from the two shade guides (VITAPAN Classical™ and VITAPAN 3D Master™) with other full sets of the respective shade guides. Each tab was matched 3 times to determine repeatability of visual examiners. The spectrophotometric shade matching was performed by two independent examiners using an intraoral spectrophotometer (VITA Easyshade™) with five repetitions for each tab. Results: Results revealed that visual method had greater accuracy than the spectrophotometer. The spectrophotometer; however, exhibited significantly better interrater agreement as compared to the visual method. While VITAPAN Classical shade guide was more accurate with the spectrophotometer, VITAPAN 3D Master shade guide proved better with visual method. Conclusion: This in vitro study clearly delineates the advantages and limitations of both methods. There were significant differences between the methods with the visual method producing more accurate results than the spectrophotometric method. The spectrophotometer showed far better interrater agreement scores irrespective of the shade guide used. Even though visual shade matching is subjective, it is not inferior and should not be underrated. Judicious combination of both techniques is imperative to attain a successful and esthetic outcome. Purpose: Clinical success of implant prosthodontics is dependent in part upon the type of implant thread design. The selection of implant thread design plays an important role in the outcome of the treatment. This study was undertaken to evaluate the pattern of stress distribution using a finite element analysis; hence, the area which would be bearing maximum load for a given design would be arrived. 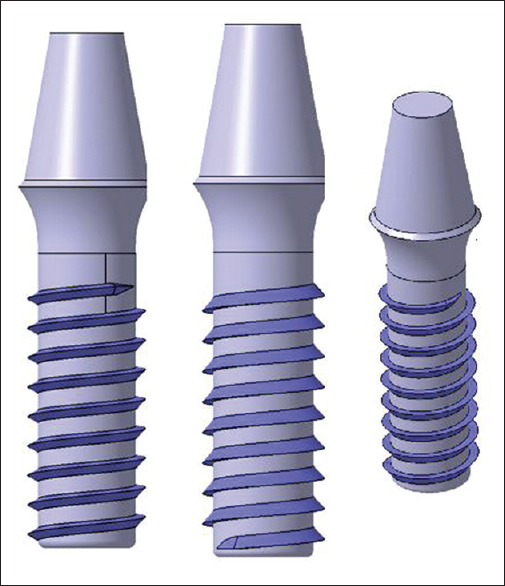 Materials and Methods: Three implants with different thread designs, namely V-thread, buttress, and reverse buttress thread designs were considered and dimensions were standardized. The site considered was the mandibular molar region with cortical and trabecular bone assuming to be isotropic and homogeneous. The implant modeling was done with the CATIA software. Vertical loads of 100N were applied. The stresses were calculated as Von Mises stress criterion. Results: Maximum stresses were seen at the cortical bone and were transferred to the implant. Minimum Von Mises stresses were seen with reverse buttress thread design at the cortical bone. The stresses were observed least at the cancellous bone and maximum at the implant. Conclusion: Hence, within the limitations of this study the results obtained can be applied clinically for appropriate selection of implant thread design for a predictable success of implant therapy. Introduction: For fabricating dental prostheses that meet patients' demands and have good longevity and function, appropriate treatment planning and decision-making are required. Therefore, not only technical skills and clinical judgment of the dentist are needed, but also patients' attitude toward treatment plays a critical role in posttreatment satisfaction. Aim: The aim of this study is to investigate the factors affecting decision-making and the selection of dental prosthesis by the patients. 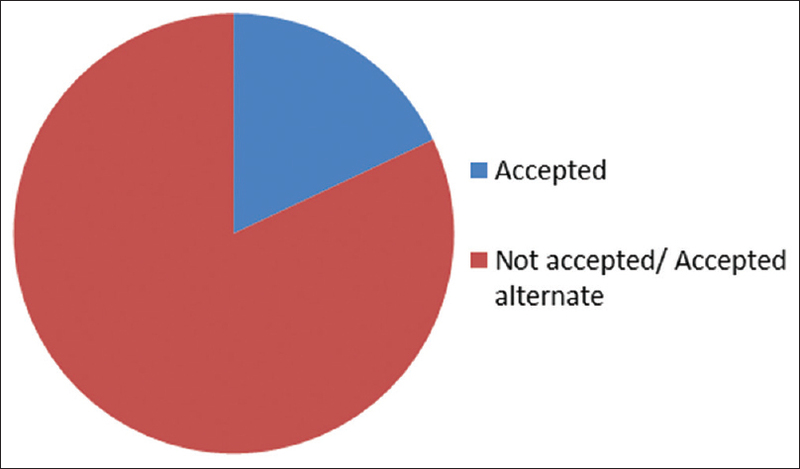 Materials and Methods: A cross-sectional survey to determine patients' attitudes about replacement of teeth was conducted. This survey was performed with the help of a prevalidated questionnaire, which contained the demographic data of every patient, whether or not they accept the treatment plan proposed by the dentist, and a close-ended multiple choice question stating the reasons cited by them if they decline the proposed treatment plan. Results: The data were subjected to statistical analysis by Chi-square test at a significance level of P< 0.05. A relationship between the demographical information such as age, gender, educational status, marital status, and monthly income of each patient and the single best reason opted by them to not undergo the proposed treatment plan was established. Conclusions: In the sample of population studied, most of the patients declined the proposed treatment plan and accepted the alternate one. High expenditure is the most common reason for this rejection. Objective: This survey was undertaken to assess dentist's opinion regarding the occurrence and pattern of food impaction in relation to fixed partial denture (FPD) prostheses, its commonly observed consequences, factors contributing to it, and its management. Methods: A descriptive survey was conducted on a sample size of 150 dental practitioners. The pro forma consisted of informed consent, demographic information, and questionnaire. The results were tallied and quantitative analysis was performed to obtain the descriptive statistics for the data using SPSS version 20. Results and Interpretation: All the study respondents had come across patients who complained of food impaction in relation to FPD. 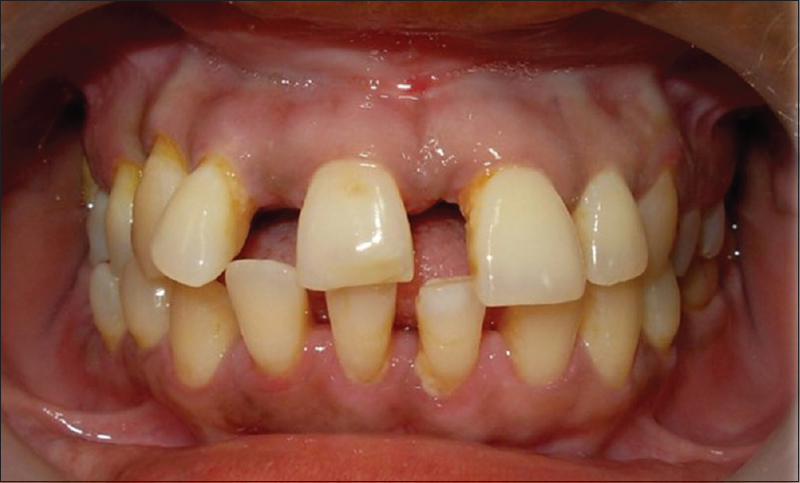 The most common consequences of food impaction were proximal caries of the adjacent teeth and interdental bone loss. Majority of the dentists considered faulty FPD design with improper contact relation, improper crown contour, poor margin adaptation, and faulty pontic design as the most likely reason for food impaction. Repeating the FPD with emphasis on prescribing and reinforcing the use of proper interdental aids was considered as the ideal treatment option. It was also observed that about half of the dentists always communicated inadequate information of the FPD prostheses that needed replacement to the dental laboratory technician for the successive bridge. Most of the times, prosthodontists were consulted to rectify the problem of food impaction resulting from faulty FPD prostheses. However, it is obvious that it is easier and more prudent to prevent rather than treat food impaction. This study gives an overview of some of the common errors in designing the FPD prostheses which often lead to food impaction and measures to be taken to overcome them. Conclusion: It may be concluded as all the dentists participating in the survey agreed that food impaction is one of the common complaint among FPD Patients. Proximal caries and interdental bone loss were the prevalent outcomes of food impaction. Faulty FPD design was allegedly attributed as the reason for food impaction. 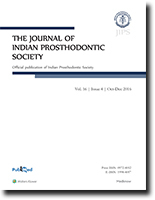 Prosthodontists were routinely consulted to resolve the dilemma of food impaction. However, it is rational to prevent food impaction rather than to tackle the sequel later. Aim: The aim of this study is to compare the retention force of three different types of overdenture attachment systems used in implant-retained mandibular complete overdentures. Materials and Methods: Twenty-one similar acrylic resin blocks were prepared and divided into three study groups: Group A (snap attachment) - 10 specimens, Group B (locator attachment) - 1 specimen, and Group C (syncone attachment) - 10 specimens. 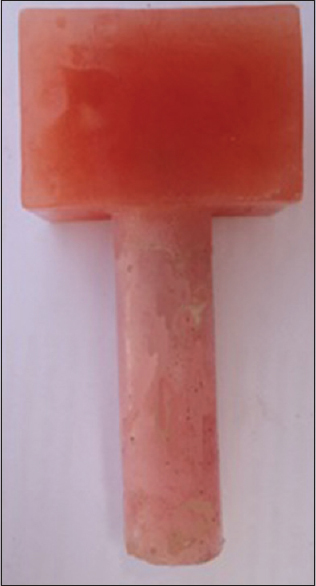 A single rectangular heat cure acrylic resin block with two implant analogs 22 mm apart was used with all specimens. Each specimen was subjected to 5500 cycles of insertion and removal in the presence of artificial saliva, representing 5 years of usage. Retention was measured three times for each specimen using universal testing machine. Data were analyzed using one-way and two-way analysis of variance at 95% level of confidence. Results: Locator attachment group (Group B) showed the greatest retention level throughout the study, followed by snap attachment (Group A), and syncone attachment (Group C) showed the lowest retention level. Conclusion: Regardless of the initial retention level of overdenture attachment, gradual loss of retention values is inevitable. However, the rate of retention loss in overdenture attachments is higher in types which comprised plastic parts within their components, rather than those totally made up of noble metals. Dental implants with their increasing success rates and predictability of final outcome are fast becoming the treatment of choice for replacing missing teeth. Considering the success of immediate implant placement in reducing tissue loss and achieving good esthetic results, is making it a more popular treatment modality in implant dentistry. Understanding the management of gingival tissues in relation to implants to obtain maximum esthetics is of utmost importance. The use of provisional abutments and immediate temporization has a proven track record of their ability to produce optimal esthetics and to guide the tissue response during the healing phase. With careful patient selection and execution, customized healing abutments can provide an effective method to enhance the esthetic and emergence profile for anterior implant restorations. Acquired external auditory canal (EAC) atresia is an infrequent entity which can originate from a number of different causes including trauma, infection, neoplasia, inflammation, and radiotherapy. Posttraumatic atresias are exceptionally rare, only 10% of atresias are attributed to trauma in most of the series. The management of stenosis of the EAC is challenging as it is associated with residual hearing loss and late recurrence. Traditional stents often occlude the EAC, resulting in a temporary conductive hearing loss. 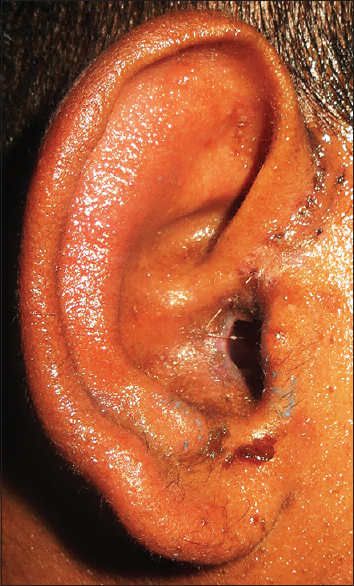 This case report describes the technique of fabrication of a wide-bored acrylic stent which attained additional retention from the folds of the auricle. The customized earmold stent effectively prevented restenosis, while the large bore provided ventilation and improved hearing subjectively during the stenting period. Rehabilitation of mandibular resection poses functional, esthetic, and psychological challenges. The deviation and rotation of the mandible toward the resected side leaves the patient with almost no option of chewing. 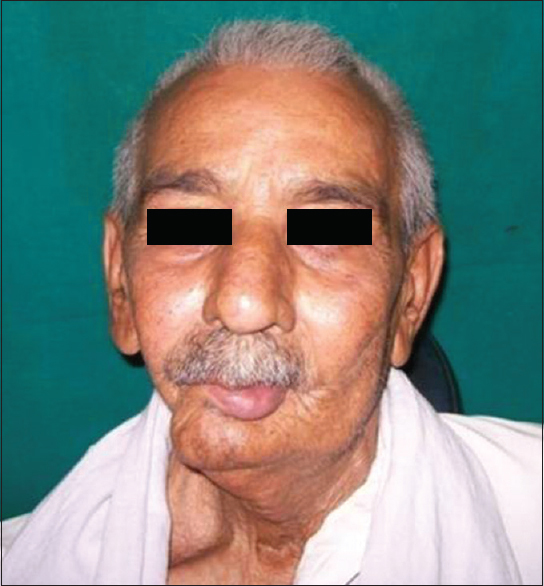 This is aggravated if the patient is edentulous. 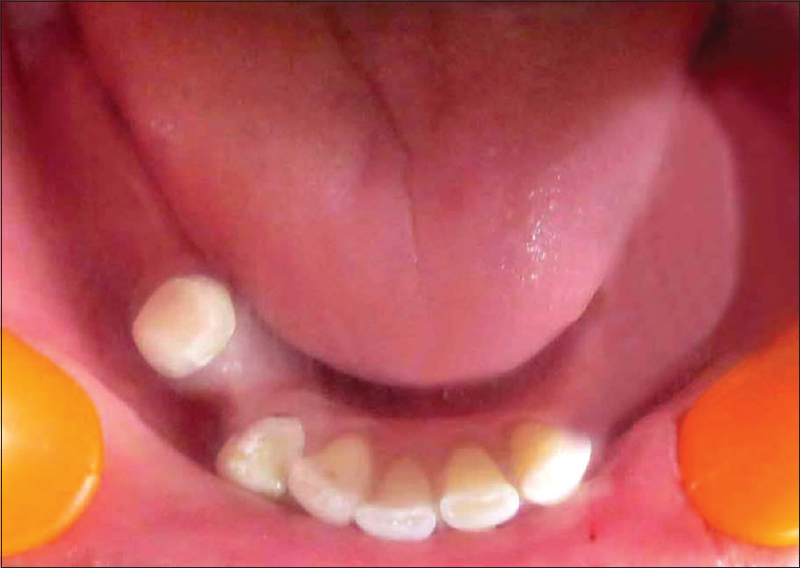 The case report discussed in this article was an edentulous patient taken up with the primary goal to limit deviation toward resected side and provide a stable and retentive prosthesis to the patient. Two implants were placed anteriorly, splinted with bar and clip supported superstructure. The splinted implants with bar and clip superstructure provided the mandibular prosthesis with retention and some support. A posterior implant was also placed in the region of mandibular first molar on the left side for added support. This provided with a tripod configuration and limited the prosthetic movement of the mandibular prosthesis. This case report highlights an alternate way toward the rehabilitation of edentulous mandible post mandibular resection when surgical reconstruction may not be feasible. The positive psychological effects of improving patients' smile often contribute to an improved self-image and enhanced self-esteem. Periodontal disease may lead to tooth and tissue loss that can result in esthetic problems. Combined periodontal/prosthodontic treatment for patients with advanced disease is well documented. 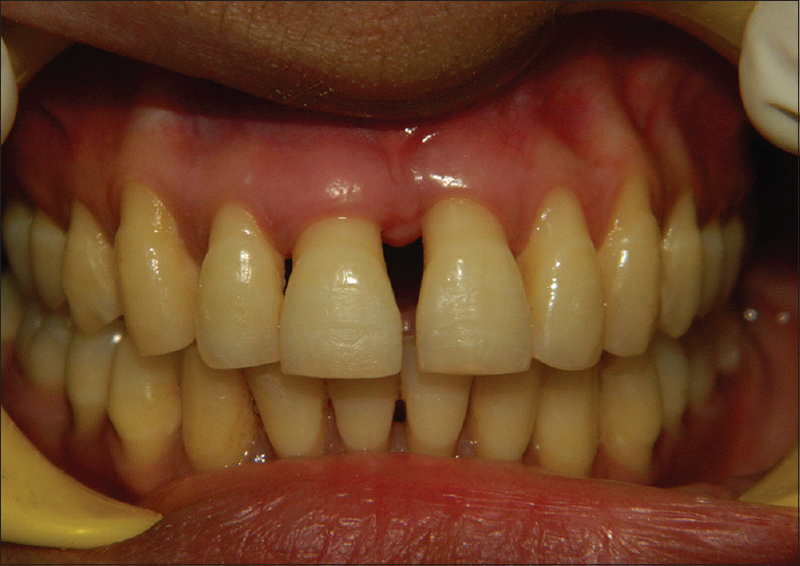 This case report illustrates a method of treatment for an advanced tissue loss in an esthetic area using a removable silicone gingival prosthesis/mask. An adhesion is a band of scar tissue that binds two parts of the tissue together, which develops when the body's repair mechanisms respond to any tissue disturbance, such as surgery, infection, trauma, or radiation. Prevention of unwanted scar bands is of utmost importance to develop esthetic and healthy tissue. 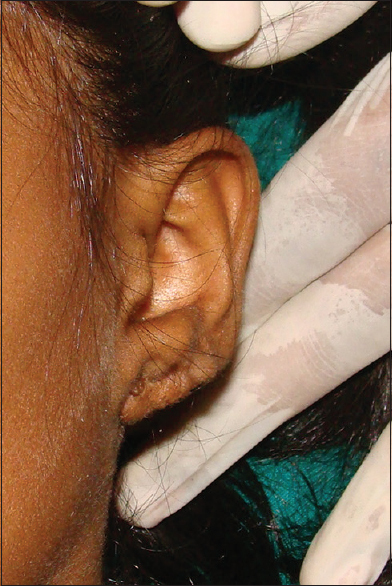 This article describes a technique to prevent the adhesion of the surgically reconstructed ear lobule with facial skin, using novel lobule separator prosthesis. The Kennedy Class I and II distal extension situation poses a challenge to the prosthodontist as it inherently possesses a lack of stability, which may be attributed to the difference in compressibility of the mucosa and the periodontal ligament surrounding the distal-most abutment tooth. This results in a rotational tendency of the prosthesis around the line connecting its terminal abutments. Placement of osseointegrated dental implants in the posterior edentulous regions, distal to the terminal abutment provides improved vertical support to the distal extension removable partial denture, effectively converting its intraoral performance from a Kennedy Class I to a Class III situation, thereby resulting in improved stability of the prosthesis and consequently, enhanced patient satisfaction. This case report describes such an approach to the restoration of a Kennedy Class I partially edentulous situation. Extreme resorption of edentulous maxilla may cause difficulty during fabrication of a maxillary complete denture. Increased inter-ridge distance often creates a clinical problem due to heavy-weighted maxillary prosthesis. 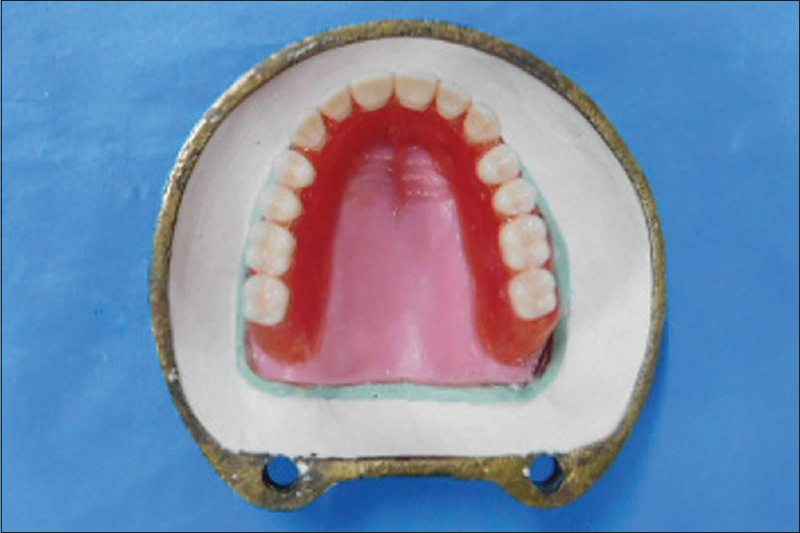 This article elaborates an alternative approach for hollowing a maxillary complete denture. 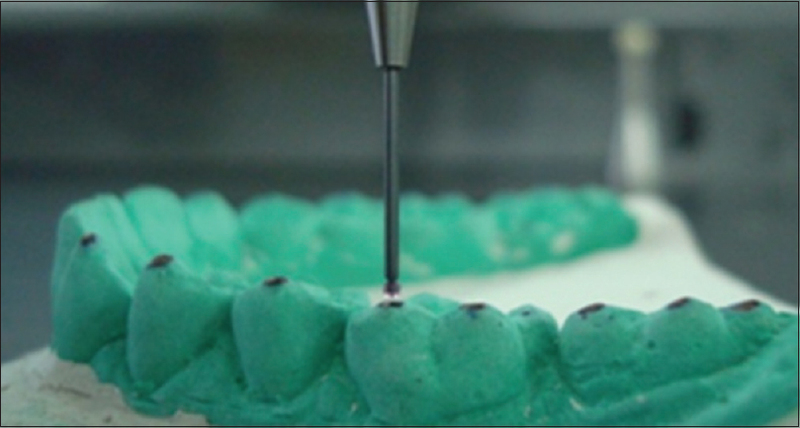 It utilizes a clear template of the trial denture facilitating the creation of a gelatin cavity form. This hollowing ensures the even thickness of both denture base resins for structural integrity and reduces the heaviness of the denture.